I'm Chris Shattuck and this is "How Hooks Work and How to Use Them". In this video we're going to build a module tracking history by implementing several different hooks and take a look at how hooks work in the back end. In this video I'm going to be explaining how hooks work. 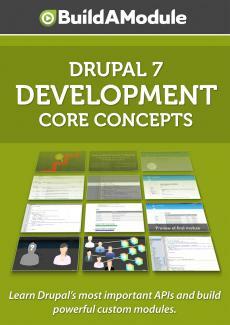 We're going to look at how Drupal core implement several different of it's most commonly used hook functions. And then we are going to go through in detail and create a module that will use several different hooks in order to create it's functionality. And while we'll be covering more hooks in future videos, there's no way we can exhaustibly cover them all. But if you are curious just exactly what you exactly have to work with , you can go to this page on "API dot drupal dot org" that includes information about all the different hooks in Drupal. Just search for Drupal hooks in Google and make sure you're on the Drupal 7 tab. If you scroll down, you'll see a list of hooks. And these are all hook that are implemented in Drupal core that you can use to alter the way that Drupal works in some way, from adding new blocks, to editing existing blocks, to adding new permissions, to changing how the search index is actually indexed. It runs the gambit pretty much anything you can think of to modify in Drupal, you can do through hooks and that's major power. Throughout this video, we're going to be building a module step by step that demonstrates how to use several of the most commonly implemented hooks. In the end are module will display a block that will show the last several pages that have been visited by the current user. This functionality is kind of cool and we are going to be continually enhancing this module as we go through future videos to interact with the database layer and the themeing layer as well. But this is where we are starting. Let me quickly show you some of the behind the scenes configuration for this block as well. The number of pages that it displays is variable and you can change this setting in a configuration form. Let me go ahead and show you what that look like. I'm going to click on the cog wheel here and configure block. And we see here the "number of items to show". And we can drag down here and add all the way up to one hundred and ninety nine.